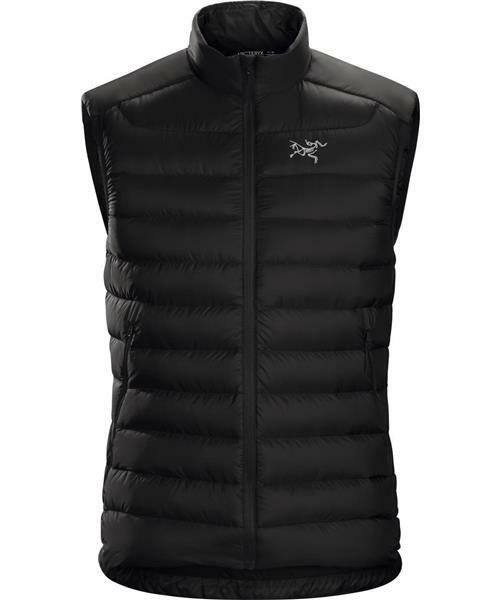 Cerium LT Vest - Mens is rated 4.9 out of 5 by 9. Rated 5 out of 5 by mcgoverny from Fantastic fit, style, and performance I am in love with my Cerium LT vest. It looks great, I'm comfortable in it, and the high quality down is excellent at moderating my temperature. So much that i can wear it around the house comfortably. It's easy to layer under a jacket in the cold, and warm enough as an outer layer in Canada's cold winter climate. I'm 6'2" 170 lbs with a 30" waist and wide shoulders, and the medium fits very well. It tapers enough at the waist that it doesn't slump at the sides and its broad enough for my shoulders. Its not too short either. Rated 5 out of 5 by AbbasMir from Amazing lightweight product I received the Cerium Vest around 2 weeks ago and have yet to put to it down. It truly is a piece of art; lightweight, fitted and extremely functional, in that it provides warmth and flexibility. I had previous owned the North Face Nupste, which was far heavier and cumbersome in comparison. My only reservation is that i feel the zips may need in time to be changed. They are a bit fiddly and considering the cost I think more work needs to be spent on this, that aside, this product is just so fab. Without doubt Arcteryx is the most impressive outdoor brand I have come across, aligning functionality with a contemporary design. Rated 5 out of 5 by Markussp3 from Great vest I own a Large Theta AR shell which is a perfect fit. Originally I ordered a Large in this vest, but it was just too tight across the chest, so I had to exchange it for an XL A draw cord around the waist would be a nice addition, as it can ride up a bit. Very light, very warm and very well made. Get your size right and you'll be very happy. Rated 4 out of 5 by SoerenT from Awesome Vest. Had this vest for some days now and i really like it. It has a slim fit, but i guess that is necessary to keep you as warm as possible. Be careful whit the zipper if you use it whit out having the vest on, as it easily goes in to the fabric, and can damage the vest. The vest fits in to a small bag that comes whit it, so it will not take up much space if you ned to stove it away. Rated 5 out of 5 by Catlen from First Class Stuff!! I brought this vest to the Arctic Tundra, just inside the Arctic circle. It performed very well, especially with a simple rain jacket over it or a fleece sweater underneath. A vest like this I think is essential for any cold or winter travel. Rated 5 out of 5 by Landao from Just what I needed 6' at 170 lbs, M fits like a dream. This vest is a great addition to my gear. Perfect as a standalone for brisk spring days, cool fall evenings, and if your body runs warm it's the ideal mid-layer piece. Packs nicely as well. Rated 5 out of 5 by Cstmike from Beautiful! After having bought the hoody when it first came out last year, I jumped at the chance to pick up a vest when it became available. Light, warm, functional both as outer and inner layer. Will work well watching son in cold hockey arenas! Rated 5 out of 5 by gulf from Best Vest 182 cm at 85 kg I have a L, tried a M but it was too small. It's just what it says, streamlined, lightweight and packable. And really nice to wear.